Location:Isle Of Man, Jersey, Lancashire. That's wierd....i've found the Big S to be pretty good over weed etc as some of the stretches I fish are very shallow with lots of streamer weed etc. Going to do a spot of lure fishing this weekend as I haven't got time to pi** about with baits....may try out some grubs etc for the perch.....just need to catch something to make me feel better after last weekends blank! I have had some good fish on the big soft rubber Imitations, the perch types are excellent and look like the real thing, Bull dawgs are good in deeper water too just a few too many hooks! Why fish 'exposed hook' style lures when the area is snaggy or weedy? There are many weedless / snagless lures available to suit most any depth of water. Ha Ha Keep us on our toes....more like make me irritated! Never tried Dawgs in rivers but I know they snag up loads on pits/reservoirs due to the belly hook...must be even worse on rivers. You could always remove the offending hooks, I use them on the Lakes were the drop offs can be as deep as 60ft on Coniston, just got back from Derwent Water today managed to get about 100 yards out and wind blew up, white horses and enough chop to warrant an early exit needless to say NO FISH, but the scenic detour on way home made up for it. Never done any river piking always on Lakes, I think I will have a go, Neil would you Lure fish or deadbait on the rivers? Glasson Dock is just around the corner from me, It gets hammered, meant to be some decent pike in there but I'm afraid everyone knows it, the locals hate the pike because they take a liking to ducklings, have you tried round by the school at the back there is a load of Jetties you can walk along a path to get to them meant to be a good area. I do a mixture of lure fishing and deadbaiting on rivers depending on how much time I have got. TBH I have generally caught bigger fish on deads paternostered and float ledgered but always varies with time of year, river flow etc. At the moment things are very slow so I'll probably use lures to find/aggravate the fish into striking! Nice to see "argyll" in a thread too. Reading what he put reminds me of what a nice and helpful geezer Gerry was. Worth bringing the thread back up for that alone. Too right. I don't think AN ever quite recovered after the loss of Gerry's dry wit and encyclopedic knowledge. I never met the man but I regularly swapped lures, stories and online chat time with him. I was gutted when he died. It's worth taking a while to sit and read through his posts. I will second that Poach.Thanks for taking the time to link to his posts. I was only thinking today how "unfair" it is that I now live close enough to have taken him up on trips out on his boat on the Thames.Just wish I had made more of an effort before he left us. Could you name some decent ones? How do weedless spooons actually work? Abit of thin wire doesnt seem like it would stop much weed tangling round the hooks. The lures shown here are all types that I have fished with and have caught fish with. Probably the grandfather of them all is the Johnson Silver Minnow spoon. Use just as you see here or put a soft plastic trailer on the hook to give it a larger presence. Has a nice wobbling action when you retrieve it. "Texas Rig" any of a variety of plastic worms. The hook point is not exposed but when a fish bites down on the lure, the worm pulls away and the hook point is exposed so you can catch. This photo is from http://www.bassfishi...g/rigging1.html where they are showing details of making this rig. "Scum Frog" is purpose made for fishing over the top of any sort of weed you can imagine. 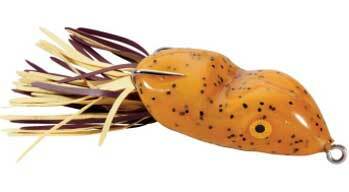 Top water only, the lure rides on top with the hooks protected by a hollow rubber shell body. The hooks are exposed when a fish bites. Buzz Bait has a large blade so you can keep it on top with a fairly slow retrieve. Designed to run on the surface and the hook point will be up so above any weed.